﻿﻿﻿Are You King of the Roost? ﻿﻿Acing this quiz on turkey hunting laws would be a real feather in your cap. ﻿﻿﻿﻿﻿﻿﻿Spring turkey hunting season starts soon. Are you ready for a safe and productive hunt? Take this quiz to find out, and maybe even learn something new along the way. Find the answers below. 1. There are three subspecies of wild turkey found in Texas. Which subspecies is specified on tag No. 2 of a Texas resident hunting license? 2. You have a turkey hunt planned for Saturday afternoon, but you haven’t had a chance to get a hunting license yet. So, on Saturday morning, you decide to buy your license online. Will you be able to hunt turkey legally later that day? 3. You have a great hunt and bag two turkeys legally. Can you give one to a friend? 4. What kind of stamp endorsement does a Texas resident need to hunt turkey? 5. You plan to take your 13-year-old son on a turkey hunt with several other children and their parents. Just days before the hunt, one of the other parents mentions that his daughter recently completely a hunter education training course required by the Texas Parks and Wildlife Depart­ment. Your son hasn’t completed the course. Can he legally hunt? 6. When hunting turkey (or other game animals, except for squirrel) with a bow or crossbow, your projectile must be equipped with a broadhead hunting point. What is the minimum width the broadhead must meet? 7. You are celebrating the taking of a large Rio Grande tom turkey when a game warden arrives to check licenses. You show your bird proudly, and you point to the tag, where you’ve filled out the name and location of the property where you are hunting. You’ve also blacked out the correct month and date of the kill with a ballpoint pen. Think you’ll pass the warden’s inspection? 8. About 10,000 eastern wild turkeys live in the forests of East Texas. These birds may be hunted in 28 counties, but there are some special regulations. Can you list the regulations? 9. The Texas Parks and Wildlife Department offers many low-cost, family-oriented opportunities to hunt on public lands — including state parks and wildlife management areas — throughout the state. Are you required to wear blaze orange while on these hunts? 11. You are about to leave for a turkey hunt when you realize you can’t find your hunting license. What should you do? a. Go buy another one. b. Hunt without your license. If you happen to get checked by a game warden, he or she will be able to access records that show you purchased a license. c. Get a replacement for the original. d. Attempt to somehow place the blame on your spouse. 12. You’ve just finished hunting with a group. You didn’t get a turkey, but several of your fellow hunters did. They offer you a few feathers as a memento of the hunt. Can you accept the feathers and possess them legally? 13. Your cousin from Louisiana is planning to join you for a three-day deer hunt in December. He wants the option to take a turkey if he sees one. What type of license does he need to buy? 14. The general spring turkey season hasn’t opened yet, but a friend of yours mentions that his son bagged a trophy gobbler the previous weekend. What is the possible explanation for this? 15. What was the bag limit for turkey in 1903? b. One in the spring, one in the fall. c. None. They couldn’t be hunted. 16. You’re hunting for mule deer near the Davis Mountains when you spot a turkey that looks a little different than the common Rio Grande subspecies you’re used to seeing. This bird is a bit larger, with white-tipped tail feathers. You come to the conclusion that it is a Merriam’s turkey. You hadn’t planned on shooting a turkey, but this is such a beautiful bird, you consider taking advantage of this chance sighting. Can you shoot this bird legally? The Texas Parks and Wildlife Department reminds readers that the answers to these questions are based on the scenarios presented. If a scenario changes, the answer may change. The provisions of the law governing game animals are subject to changes by the Texas Legislature and the Texas Parks and Wildlife Commission; therefore, answers to these questions are subject to change. The answers were verified by Jason Hardin, TPWD upland game bird specialist. To study the hunting laws in full, visit the TPWD website at www.tpwd.state.tx.us. 1. The Rio Grande turkey, which is by far the most populous and widest-ranging wild turkey subspecies in our state. 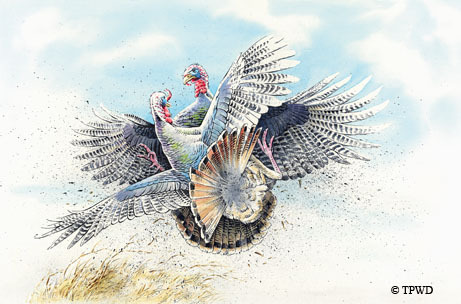 The other two subspecies with populations in Texas are the eastern turkey and the Merriam’s turkey. 2. Buying a hunting license online offers convenience and flexibility, and in some cases, you can use your license immediately. But if you are planning to hunt a species that requires tagging (i.e. deer or turkey) you will either have to wait until you receive your license in the mail or purchase your license in person at more than 1,700 locations across the state. 3. Sure, you can give all or part of your legally taken turkey to another person, but you’ll need to provide your friend with a wildlife resource document (WRD). The WRD — which includes contact information and other pertinent details — must remain with the turkey until it reaches its final destination and is finally processed. You can obtain a copy of a WRD in the Outdoor Annual or on the Texas Parks and Wildlife Department website. 4. Upland game bird stamp. You also need that stamp to hunt pheasant, quail or chachalaca. Exceptions: Holders of a nonresident spring turkey license, youth license, lifetime hunting license or super combo license don’t need an upland game bird stamp to hunt turkey. 5. Anyone born on or after Sept. 2, 1971, who wishes to hunt in Texas must successfully complete the hunter education training course. But your son can still hunt, with the proper accompaniment. The accompanying person must have a Texas hunting license, must be at least 17 and must have passed the training course (or be exempt). Your son must remain within normal voice control of the other person during the hunt. 6. Your broadhead — fixed or mechanical — must be at least 7/8 of an inch in width and must have at least two cutting edges. 7. You might receive a citation. The month and date must be cut out, not blacked out. 8. Shotguns are the only legal firearm that may be used to hunt eastern turkey; no rifles or handguns. Bows and crossbows are lawful. Hunting over bait is not allowed. Turkeys must be taken to a check station within 24 hours after they are killed. Harvested turkeys may be field-dressed but must otherwise remain intact. Eastern turkeys may be hunted in the spring, and the bag limit is one. 9. Depends on what and where you’re hunting. In most cases, when you are hunting turkey or migratory game birds on state land, blaze orange — also known as hunter orange — is not required. To learn more about these public hunts, visit www.tpwd.state.tx.us/huntwild/hunt/public. 10. No, you need the archery stamp endorsement only if you are hunting turkey (or deer) with a bow or crossbow during an archery-only open season. 11. Get a replacement. Licenses and stamp endorsements that have been lost or destroyed can be replaced at any license sales location. You’ll need to sign an affidavit and pay a small fee. Under no circumstances should you hunt turkey without a license. 12. Yes, you may possess the feathers legally, and the feathers may be sold or purchased, assuming the turkeys were harvested legally. Keep in mind that the feathers and other parts of protected birds — hawks, owls, eagles and almost all other nongame birds and songbirds — may not be possessed or sold. 13. Your cousin needs a nonresident general hunting license, with an upland game bird stamp. The special licenses listed are not valid for deer or turkey, and, of course, the spring turkey license isn’t valid in the fall. 14. Your friend’s son probably took part in the youth-only spring season, which provides expanded turkey hunting opportunities for licensed hunters 16 years of age or younger. There are also youth hunting seasons for deer, squirrel and waterfowl. 15. Amazingly, it was 25 per day. By the late 19th century, all subspecies of turkey in Texas had been virtually wiped out by overhunting. So, in 1903, a bag limit of 25 per day was established, and the season was shortened to five months. No surprise that these extremely liberal regulations — and few game wardens to enforce them — did little to reverse the decline in numbers. Tighter laws enacted in 1919, along with landowner cooperation and restocking efforts by the Texas Parks and Wildlife Department, helped the Rio Grande and eastern turkey populations make a strong comeback in their respective ranges. 16. 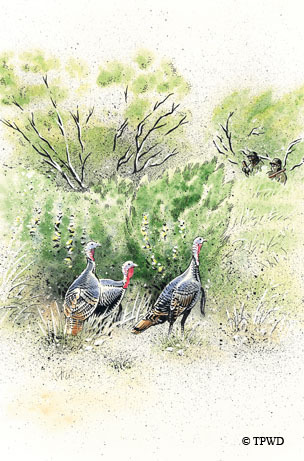 As with Rio Grande and eastern turkeys, heavy hunting pressure on Merriam’s turkeys more than a hundred years ago took its toll on this subspecies. Now, after restocking efforts, there are a few small populations of Merriam’s turkeys living in isolated pockets of West Texas and the Panhandle. In a county with an open fall season, you may harvest a Merriam’s turkey (tagging it with a Rio Grande turkey tag) if you are hunting legally in an area that also has Rio Grande turkeys.